Your TWO WAY Fillet® fillet tool will ship within 2 business days after receipt of payment. Unless otherwise requested, all shipments are done through the United States Postal service. A USPS tracking number will be sent to your provided email address. If you prefer delivery by another carrier, or more rapid delivery via UPS or FedEx, or with a required signature, an additional cost will be applied, so please contact us along with your order letting us know this preference and we will work to accommodate your desire. At this time the only international shipping will be to Canada. Shipping fees include handling and packing fees as well as postage costs. Handling fees are fixed, whereas transport fees vary according to total weight of the shipment. We advise you to group your items in one order. We cannot group two separate and distinct orders placed separately, and shipping fees may be applied to each order. Your package will be dispatched at your own risk, but special care is taken to protect fragile objects. Boxes are amply sized and your items are well-protected. 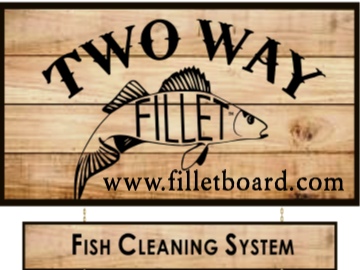 If you would like to purchase a TWO WAY Fillet® fish cleaning system and you live outside the United States please contact us on our contact page and describe your location and we will investigate potential shipment charges. Returns are accepted on items ordered by mistake and in unused condition, you pay the postage, and we will extend a refund for your purchase price less the cost of shipping. This includes products we may sell manufactured by other companies. TWO WAY Fillet® fish cleaning system is warranted against breakage for one year from date of purchase. Damage as a result of misuse, being run over by a vehicle is not covered. Lost parts are not covered. Replacement clamps may be purchased. Package return in original packaging or similar and we will cover the cost of shipping. Warranty of products that we may offer from other companies must be handled by those companies warranties.